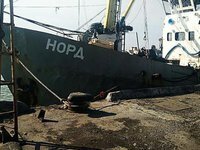 Vladimir Gorbenko, the captain of the fishing vessel Nord detained by Ukrainian border guards (home port Kerch), who has not made contact with his Ukrainian lawyers since late January 2019, is in Crimea. He gave an interview to Komsomolskaya Pravda. The interview is available for viewing on the paper's website. "I did not have any restrictions on returning home.. I crossed the border legally on my Russian passport," Gorbenko said. Gorbenko's lawyer Alexander Rudenko said on February 1 that the captain was missing and contact with him was lost. He added that Gorbenko did not plan to go anywhere. Russian Foreign Ministry spokesperson Maria Zakharova earlier said that the ministry and the Russian embassy to Ukraine were trying to find out more about the captain's disappearance in the country where he is under investigation. On March 25, 2018, the State Border Guard Service of Ukraine detained the Nord and its ten-member crew in the Sea of Azov. Its captain was accused of violating the rules for sailing to and from what Kyiv calls occupied Ukrainian territory with a view to harming the country's interests and illegal fishing on industrial scale. A court in Kherson released the captain on a personal surety. During the preliminary inquiry, Gorbenko stayed with relatives in Melitopol in the Zaporizhzhia region. On June 19, the court refused to extend the captain's obligation not to visit Crimea. The Obolonskyi District Court has been hearing the case since October 16, 2018. On January 10, the court adjourned the case to February 1. The other crewmembers have been accused of illegally crossing the Ukrainian border. Two returned to Crimea from Ukraine via Belarus in April. The other seven were swapped in October for seven fishermen from two small Ukrainian vessels, the YaMK-0041 and YaOD-2105, who were caught poaching off Crimea in August 2018. The captain of the former, Viktor Novytsky, was charged with illegal fishing by using his professional position. Last fall, Russia and Ukraine began talks over the repatriation of Gorbenko and Novytsky, Russian Human Rights Commissioner Tatyana Moskalkova said in late October.